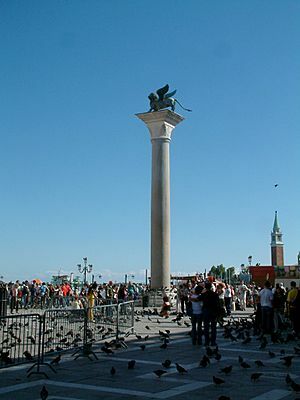 A column in architecture is a vertical element that transmits the weight of the structure above to the structure below. Columns can be either a single piece or several pieces put together. Columns are frequently used to support beams or arches on which the upper parts of walls or ceilings rest. Stone columns were already used in the architecture of ancient Egypt as early as 2600 BC. Ranakpur temple marble columns with frescoes, India. Illustration of Doric (left three), Ionic (middle three) and Corinthian (right two) columns. Column Facts for Kids. Kiddle Encyclopedia.